Global SS7 experts, Squire Technologies confirm that its innovative MGC Media Gateway Controller will headline the SVI range of carrier grade products at CMMA 2009 stand #5J2-09. The software only SVI MGC enables SS7 on Cisco and other leading third party gateways providing greater access to competitive IP solutions and is a must for any new entrant wishing to compete with multiple VoIP service offerings. As well as focusing on the innovative product line, SS7 Signalling Experts will be solidifying its presence within Asia with its "Reaching for New Markets" campaign by offering channel partnerships with a complete package of support, training and discounts enabling distributors and resellers to deliver Squire Technologies' range of competitive carrier grade products. One of the main drivers for clients to gain a robust SS7 interconnect is often lower call rates offered by SS7 carriers over other PSTN interconnects. The MGC Media Gateway Controller provides a software-only solution that can be deployed in conjunction with market leading media gateways to offer low cost SS7 interconnect with all the advantages a robust SS7 network can provide. The SVI_MGC's centralised routing engine provides seamless interworking and interconnects between SS7, SIP and H.323 with the E1/T1 connections to the physical SS7 network controlled by the SVI_MGC Media Gateway Controller over SS7 on Cisco Gateway. The carrier grade five nines uptime is ensured with support for 1 + 1 redundancy architecture. Available with a flexible payment plan that allows clients to spread the investment over 6 or 12 months the SVI_MGC SS7 Media Gateway Controller product offers a true carrier grade solution at affordable prices. The resounding success of the company in recent years is confirmation of the solid product line and much of the reason it has been increasingly adopted by major carriers and service providers in more than 50 countries. "Our presence at CMMA 2009 is important for both buyers looking for low cost entry for SS7 interconnect and resellers aiming to establish a network for the innovative SVI range" says Simon Dinnage - Business Sales Director. Successfully deployed in more than 50 countries the SVI range of products provide high availability, scalability and fully featured onboard and remote management interface, catering for both small interconnect up to large international points of presence. 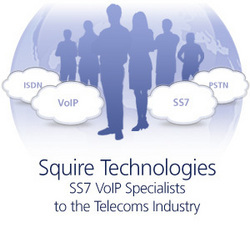 Coupled with a dedicated installation and support team, Squire Technologies can provide a complete, SS7 VoIP end-to-end service with support from pre-sales consultancy to installation to ongoing post-sales support & product development. To schedule an appointment with Squire Technologies at Communicasia, please contact Lyndon Bye at lbye(at)squire-technologies.co.uk, or simply visit the Squire Technologies stand #5J2-09.